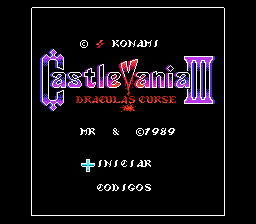 Castlevania III: Dracula’s Curse an action platforming game for the Nintendo Entertainment System. 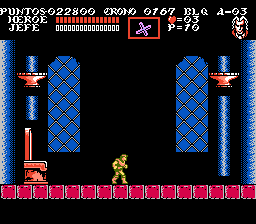 This game is known in Japan as Akumajou Densetsu. 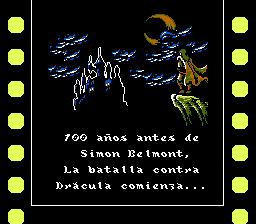 A new feature added for this game, there are three bosses that the player can recruit: Grant DeNasty (a pirate who can climb walls and is an expert dagger user), Sypha Belnades (a magic user, with various types of magic sub-weapons and a staff) and Alucard (Dracula’s son, who uses Fireballs and can change into a bat). Do note that you can only have ONE of these people on your team, and if you want a different one you have to exchange him/her for your current party member. Another new feature is the “Choose Your Path” feature. After each stage, most of the time you are given a choice between two new stages to go to next. 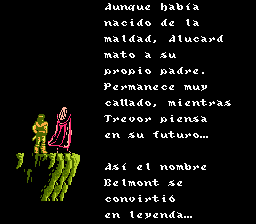 Full translation to Spanish of Castlevania III for the Nintendo Entertainment System. Based in translation of Vice, and another hacks see readme.